EDMONTON - Members of Alberta's PC party are voting today for a new leader and premier. Ric McIver, Thomas Lukaszuk and Jim Prentice will continue trying today to get out the vote by phone, online or in person. Results are to be announced around 7:30 p.m. at the Expo Centre. This is the first time that the party has used electronic voting to pick a leader. Organizers have been working hard to fix glitches from the first day of voting on Friday. Party members looking to phone in or register their vote online have faced long delays, blank screens, busy signals, lost PIN numbers or mix-ups matching them to the master voting list. And the voting may not be over. If none of the three candidates has a majority of votes by the end of today, the top two finishers move to a second and final run-off vote on Sept. 20. Prentice, a former Calgary MP, has been considered the front-runner. He has the support of almost all the PC caucus and raised $1.8 million in donations, dwarfing the $417,000 raised by McIver, and the $300,000 by Lukaszuk. The vote caps a campaign that has been running since the spring, when then-premier Alison Redford stepped down from the top job as party and caucus support evaporated over revelations she spent lavishly on travel and office perks for herself and her inner circle. Those revelations continued to drop like artillery charges into the leadership campaign, and all three candidates have promised to clean up any lingering sense of government entitlement. Prentice, a former federal MP, has used Redford's record to bludgeon Redford-era cabinet ministers McIver and Lukaszuk. Both, said Prentice, were derelict for not stopping the worst of Redford's excesses, including plans to build a swank penthouse atop a government building. 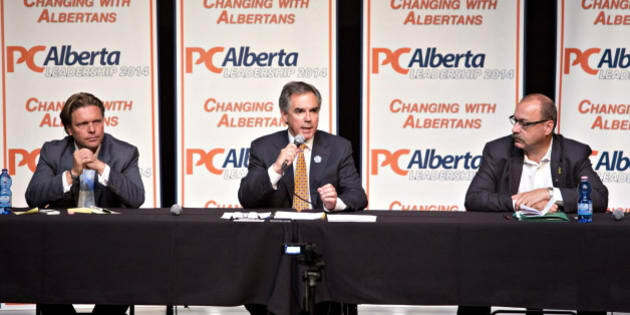 McIver and Lukaszuk in turn have accused Prentice of being another elitist member of the political old boys club. They say he is trying to buy the premiership by giving away party memberships to supporters rather than selling them for the normal $10 price.